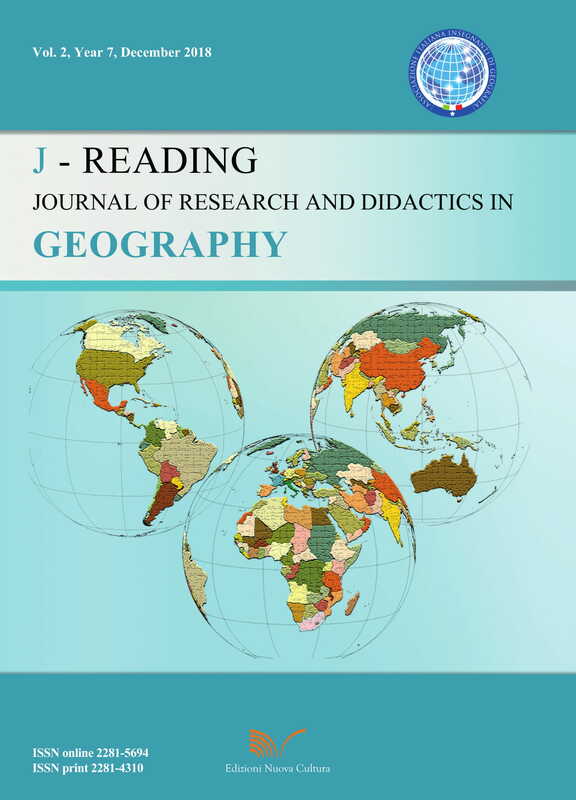 J-Reading has been awarded "Class A" by National Agency for the Evaluation of the University System and Academic Research, placing it at the top of the Italian ranking of Scientific Journals. Founder: Gino De Vecchis (Italy). Editor in Chief: Cristiano Pesaresi (Italy). Associate Editors: Clare Brooks (UK), Cristiano Giorda (Italy), Joseph Stoltman (USA), Sirpa Tani (Finland). Scientific Committee: Eyüp Artvinli (Turkey), Caterina Barilaro (Italy), Giuliano Bellezza (Italy), Tine Béneker (Netherlands), Gabriel Bladh (Sweden), Carlo Blasi (Italy), He Canfei (China), Laura Cassi (Italy), Raffaele Cattedra (Italy), Claudio Cerreti (Italy), Chew-Hung Chang (Singapore), Giorgio Chiosso (Italy), Sergio Conti (Italy), Egidio Dansero (Italy), Martin R. Degg (UK), Giuseppe Dematteis (Italy), Karl Donert (UK), Pierpaolo Faggi (Italy), Franco Farinelli (Italy), Maurizio Fea (Italy), Maria Fiori (Italy), Hartwig Haubrich (Germany), Vladimir Kolosov (Russian Federation), Jongwon Lee (South Korea), John Lidstone (Australia), Marco Maggioli (Italy), Svetlana Malkhazova (Russian Federation), Jerry Mitchell (USA), Riccardo Morri (Italy), Josè Enrique Novoa-Jerez (Chile), Wiktor Osuch (Poland), Daniela Pasquinelli d’Allegra (Italy), Petros Petsimeris (France), Bruno Ratti (Italy), Roberto Scandone (Italy), Giuseppe Scanu (Italy), Lidia Scarpelli (Italy), Daniela Schmeinck (Germany), Rana P.B. Singh (India), Claudio Smiraglia (Italy), Michael Solem (USA), Hiroshi Tanabe (Japan), Angelo Turco (Italy), Joop van der Schee (Netherlands), Isa Varraso (Italy), Bruno Vecchio (Italy), Han Zeng Lin (China), Tanga Pierre Zoungrana (Burkina Faso). Secretary of coordination: Matteo Puttilli (Italy) and Massimiliano Tabusi (Italy). Editorial Board: Diego Gallinelli (Co-Chief), Davide Pavia (Co-Chief), Victoria Bailes, Daniela De Vecchis. Referee: Ronald F. Abler (USA), Marina Arshinova (Russian Federation), Mahmoud Ashour (Egypt), Margherita Azzari (Italy), Valerio Baiocchi (Italy), Susan Ball (France), Tiziana Banini (Italy), Nathalíe Barrette (Canada), Gianfranco Battisti (Italy), Elisa Bignante (Italy), Josep Vincent Boira (Spain), Edoardo Boria (Italy), Giuseppe Borruso (Italy), Antonio Brusa (Italy), Carlo Brusa (Italy), Barbara Bruschi (Italy), Andrea Cantile (Italy), Claudio Caputo (Italy), Ester Capuzzo (Italy), Gianluca Casagrande (Italy), Benedetta Castiglioni (Italy), Filippo Celata (Italy), Antonio Ciaschi (Italy), Pamela Cowan (UK), Flavia Cristaldi (Italy), Paolo Crivelli (Switzerland), Stefano De Rubertis (Italy), Corrado De Vito (Italy), Elena Dai Prà (Italy), Christopher Dibben (UK), Fabio Fatichenti (Italy), Andrea Favretto (Italy), Carina Fearnley (Great Britain), Marina Fuschi (Italy), Graziella Galliano (Italy), Floriana Galluccio (Italy), Emanuela Gamberoni (Italy), Josè Gambino (Italy), María Manuela Redondo García (Spain), Dino Gavinelli (Italy), Francesco Giannattasio (Italy), Alessandra Giannelli (Italy), Giovanni Giuriati (Italy), Alba Belén Hermosilla González (Spain), Andrea Guaran (Italy), Daniele Ietri (Italy), Idrissi Janati M'Hammed (Morocco), Oxana A. Klimanova (Russian Federation), Peter Jordan (Austria), Sandra Leonardi (Italy), Stefano Malatesta (Italy), Miriam Marta (Italy), Cristiana Martinha (Portugal), Éric Mottet (Canada), Monica Meini (Italy), Paolo Molinari (Italy), Monica Morazzoni (Italy), Giuseppe Naglieri (Italy), Ilovan Oana-Ramona (Romania), Paolo Osso (Italy), Vincenzo Pacifici (Italy), Cosimo Palagiano (Italy), Davide Papotti (Italy), Andrea Pavesi (Italy), Antonella Pietta (Italy), Carlo Pongetti (Italy), Matteo Puttilli (Italy), Abdul Rashid Bin Mohamed Shariff (Malaysia), Maria Ronza (Italy), Eliseu Saverio Sposito (Brazil), Andrea Riggio (Italy), Lorena Rocca (Italy), Giuseppe Rocca (Italy), Maria Cristina Salvatore (Italy), Marcos A. Saquet (Brazil), Enrico Squarcina (Italy), Maria Teresa Taviano (Italy), Alberto Vanolo (Italy), Jorge Virchez (Canada), Wei Zhang (China).